The Return of Better Strangers Feminist Opera Collective! Ah! Forget My Fate Part II consists of an ambitious three-woman staging of Purcell’s most famous opera, Dido and Aeneas. A courtly drama with a twist, the production asks: how can the most powerful woman in Carthage survive when her worst enemies lie within? It’s been a little while since we heard from Better Strangers Feminist Opera Collective. Back in November last year, our Sarah C interviewed them about their show – the first part of their Ah! Forget My Fate! project. Hodge and I went to the show – “part-opera, part-cabaret abridged history of women in opera” – and I’d definitely recommend them. This week – on Thursday 26 July at 10pm – they’re back at the King’s Head in Islington, North London. They sent us this Q&A press release about the show – Purcell’s Dido and Aeneas – and their work. Why would a feminist opera company put on Dido and Aeneas? “Because in many ways, Dido and Aeneas is where it all started. Whether or not Dido and Aeneas is the first opera in Western classical tradition is up for (interminable and pedantic) debate, but it’s certainly one of the earliest that’s regularly performed – particularly here in the UK where we’re based. And Dido is the first in a noble tradition of heroines who die an arguably completely pointless death (in the context of the opera as a self-contained work, anyway), so to me it makes sense for us to begin at the beginning. “It was also written, we think, to be performed by a girls’ school, which makes it well suited for modern adaptations with exclusively female voices. What will audiences take away from BSFOC’s telling of the story? Why does it need to be (re)told? “As a producer/director, the main question I want to ask of the work is why Dido dies. That’s what’s ultimately led me personally to the staging we’re about to present here. I don’t believe that people die of a broken heart, unless they have some kind of congenital heart defect, and I don’t believe that the queen of Carthage has the kind of emotional pallor that lends itself to dying of a hissy fit after the bloke you’ve known for a couple of days decides it’s time to move on. I want there to be a driving force behind it. I want to know what it is about the witches that gives them such power over Dido. “People who aren’t familiar with classical mythology, and the Aeneid in particular, aren’t all that likely to know much about Dido, and you’re certainly not going to learn anything about her from the text of Purcell’s opera. Our telling of the story – the recasting of the witches as the shadow selves of the named characters – is intended to help to fill in the blanks. Nahum Tate (librettist)’s Dido is not controlling, masochistic, or even particularly bold, and that is why Dido’s shadow self – and, by extension, the witches – have so much power. The impulse is there, and is all the more irresistible for going unrecognised. Imagine I know nothing about opera and classical literature. What background knowledge do I need to acquire to appreciate what you’re doing with this production? Is it reasonable to assume the audiences won’t know much either? How will you help them into the opera? “Basically, I would like to transmit the idea that Dido’s story runs deeper than the text of the opera implies. I think we’re helping the audience along there with the addition of newspapers, which help to flesh out what might be going on beyond the confines of Dido’s palace and what kind of impact her dalliances might be having outside. In the mythology, Dido is a really great ruler who is essentially completely derailed by Aeneas’ arrival on the scene. I want the audience to get a sense of that. “I also want to transmit the idea that Dido’s death, to me, seems impossible without the impulse towards self-destruction. You want to take your production to schools/colleges. What do you hope to teach young people about? Opera? Feminism? Purcell’s era? Classical lit? Tropes? “A variety of things. I’d like to teach everyone in a school – meaning also the staff – how you can adapt a work like Dido and Aeneas to be performable by small forces, because I think that’s one of our major achievements with it. I want to teach performers how to be creative with limited resources, and to encourage them to think about alternative readings. “I want to teach people to sing, and not to be afraid of singing. That would be a unifying motivation in any educational work I do with Better Strangers. “Back when I was doing GCSEs, Dido’s Lament came up as a regularly used example of how melody + basso continuo worked, so I think it could be a great set of lessons to people aged 13+ of how Purcell’s music was constructed and how his melodies, instrumentation and word-setting were put together. I think it would be more fun and probably more instructive for people to do this/see it done in performance. 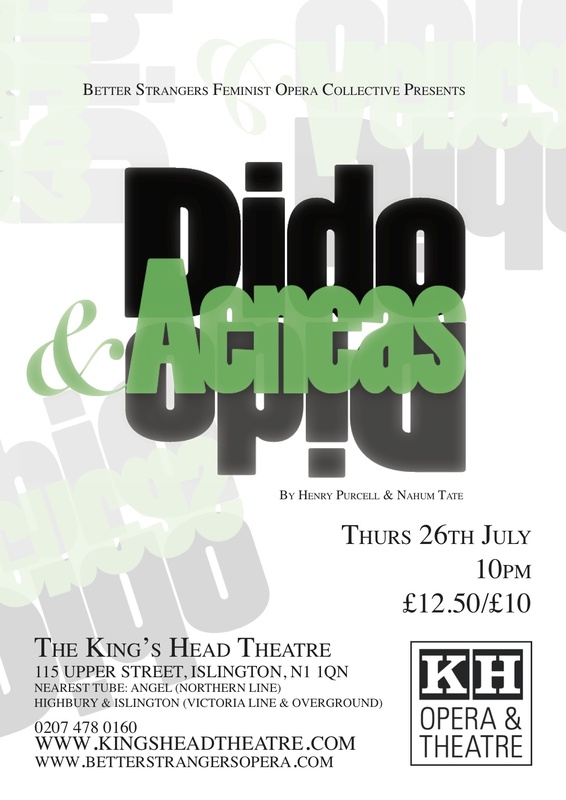 Ah, Forget My Fate Part II: Dido and Aeneas at the King’s Head Theatre, 26 July 2012. Book tickets here. Read more about the show’s development on the BSFOC blog.